Ahead of delivering a follow-up to 2017's Trumpeting Ecstacy, Full of Hell have mapped out a North American tour alongside Primitive Man and Genocide Pact. The Relapse labelmates will kick off their "Weeping Caustic Torment" North American tour in May, playing 22 dates on the continent. You can find a complete tour itinerary below. A pair of stops in Canada come near the end of the run. The bands will first play Toronto's Velvet Underground on June 11 before heading to Montreal's Bar Le Ritz the following evening on June 12. Tickets for the Toronto show go on sale on Friday (March 8) at 10 a.m.
A press release notes that Full of Hell are expected to deliver their fourth studio effort, Weeping Choir, in mid-2019. The album was recorded with Kurt Ballou at GodCity Studio. In 2017, Full of Hell also joined forces with the Body for Ascending a Mountain of Heavy Light. Genocide Pact delivered their Order of Torment LP last year. 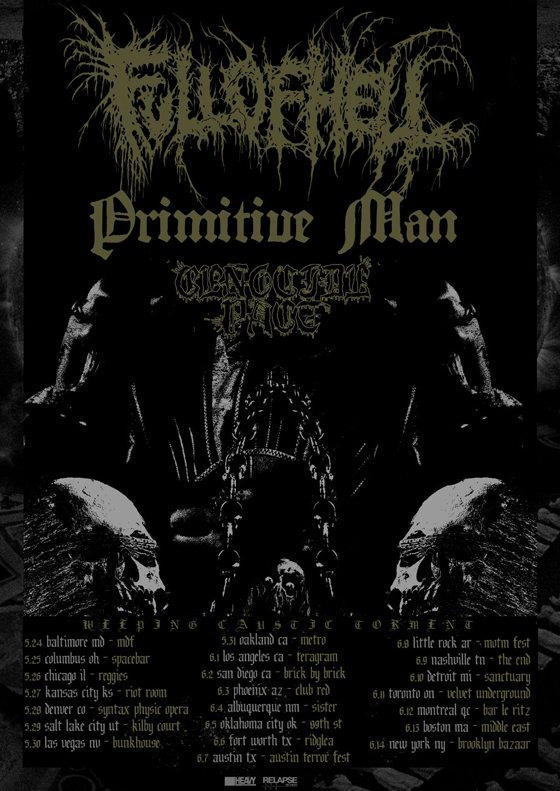 Last month, Primitive Man teamed with Hell for a split release, following last year's split effort with Unearthly Trance.